Broadband Light Phototherapy for the treatment of Sun Damage, Age Spots, Redness, Acne and Unwanted Hair. Addressing your most common skin concerns with the power of light. BBL is an innovative technology that sets new standards for skin conditions associated with aging, active lifestyles, and sun damage. 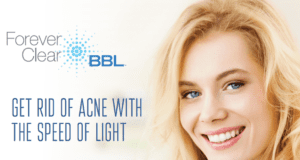 BBL energy allows the physician to precisely treat age and sun spots, small facial veins, and many other skin conditions. Your treatment will be tailored to match your skin type and your desired results. Any area of your body can be treated. The most common areas are those most exposed to the damaging effects of sunlight. The most popular treatments are on the face, neck, back of the hands, chest and shoulders. The light energy delivered by the BBL will gently heat the upper layers of your skin. The heat absorbed by the targeted areas will stimulate your skin cells to regenerate new collagen foundation, leading to increased skin firmness. This process will restore your skin to its natural beauty, blending its natural colors and making it smoother, vibrant and younger looking. In addition, the photo-thermal energy will eliminate fine vessels that cause redness and reduce unwanted melanin that produces pigmented lesions. Worried your age spots or rosacea make you look less radiant? Have you tried numerous methods to get acne under control? Are you tired of the hassle of shaving, painful waxing and tweezing? All your problems can be solved with Sciton BBL treatments!